People have different reactions to winning. Some jump up and down, very few take a calm ‘I knew I would win’ attitude, and then there are some who go into a state of shock. Apparently, many people go about their lives buying lottery tickets along the way while never really expecting to win anything significant. 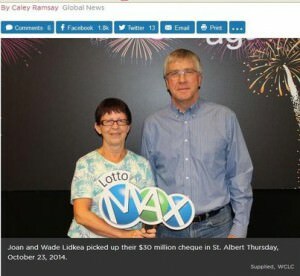 Edmonton residents Joan and Wade Lidkea were absolutely shocked when one of two lucky pick entries managed to match all six numbers drawn to win a hefty $30 million Lotto Max jackpot. And in Canada, lottery winnings are tax free. The couple went through shaking, sweaty palms, and even wanting to throw up. Once they had sufficiently recovered, they validated their win at the Ritchie Foods store where they purchased their ticket, and then claimed their huge check. Now all they need to do is plan what they will do with all that money.